Considered one of the finest American apples ever, Grimes Golden originated in 1790 near the town of Wellsburg in Brooke Co., West Virginia, where today a granite monument still stands in recognition of this outstanding apple. 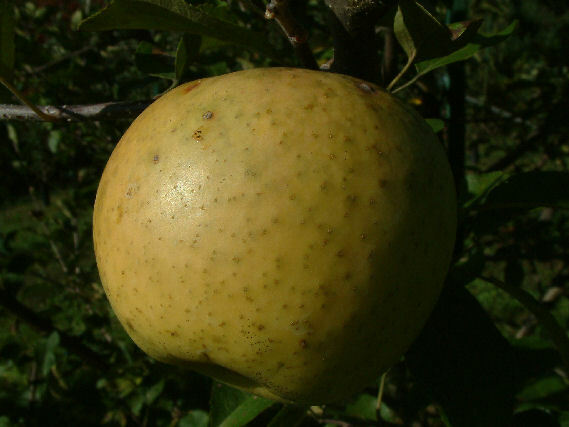 Grimes Golden is one of the parents of the widely popular Golden Delicious. Fruit is medium to large, roundish to slightly oblong with tough yellow skin with occasional patches of russet. This aromatic apple is highly flavored with tender, crisp, juicy yellowish-orange flesh. Ripens September to October and is a good keeper. My long-dead dad loved Arkansas Black and Grimes Golden apples. Could they be grafted onto something that would help them do well in Humboldt County – coastal Northern California, where the weather seldom hits 75 but seldom freezes either? Maybe 400-600 (very max) chill hours per year? 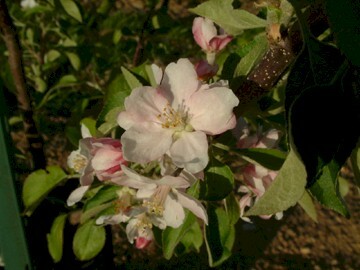 Like to know if you carry this old Grimes Golden Dwarf Apple.. Yes, we have the original Grimes Golden apple in our collection and would be pleased to custom-graft a dwarf tree or two for delivery to you in the fall of 2018. If interested, just send us your request by March 1st, 2018, and we’ll place your order in our customer files for next season. If you submit an order, please be sure to include your shipping address and telephone number.